UTILIZATION: Working terrier with ability to go to ground. Section 1	Large and medium sized Terriers. For many years, great controversy existed in the ranks of the terrier fanciers over a type of terrier called somewhat vaguely ‘the Jack Russell’. Applications were received by the Kennel Club from a considerable number of devotees of a strain of Fox Terriers bred by a Victorian hunting parson, the Reverend John Russell. 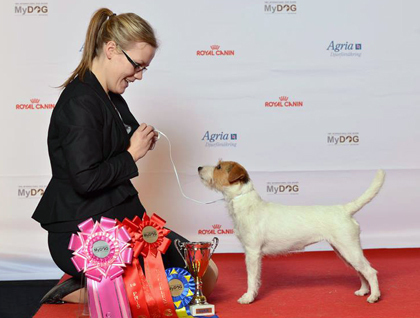 Eventually this robust and workmanlike type of terrier was recognised and given the breed name – Parson Russell Terrier. Workmanlike, active and agile, without exaggeration. Built for stamina and endurance, overall picture of balance and flexibility. Honourable scars permissible. Well balanced. Overall length from point of shoulder to point of buttock slightly longer than height from withers to ground. Length from nose to stop slightly shorter than from stop to occiput. Originally a terrier bred to work fox, a confident, energetic and happy dog that has the ability and conformation to go to ground. Bold and friendly. Skull: Flat, moderately broad, gradually narrowing to the eyes. Jaws / Teeth: Jaws strong, muscular. Teeth of a good size and set square to the jaws, with a perfect, regular and complete scissor bite, i.e. upper teeth closely overlapping the lower teeth and set square to the jaws. Eyes: Dark, almond shaped, never prominent. Keen, intelligent expression. Ears: Size in proportion with the head. V-shaped, dropping forward, tip of ear to be level with outer corner of eye. Fold not above top of skull. Leather of moderate thickness. Clean, muscular, of good length, gradually widening and well set into the shoulders. Back: Strong, straight and flexible. Loin: Strong and slightly arched. Chest: Of moderate depth, not extending below point of elbow. Capable of being spanned behind the shoulders by average size hands. Ribs carried well back, not over-sprung nor slab-sided. General appearance: Moderate width between the forelegs, well set under the body. Shoulder: Long and sloping, well laid back, cleanly cut at withers. Upper arm: Of equal length to the shoulder and at such an angle that legs are carried well back under the body, below the point of the withers. Elbow: Close to body, working free of the sides. Forearm: Strong and straight, turning neither in nor out. Length of forelegs should be slightly greater than depth of body. Metacarpus (Pastern): Strong and flexible. Forefeet: Compact with firm pads, toes moderately arched, never flat or open, turning neither in nor out. General appearance: Strong, muscular, with good angulation. Stifle (Knee): Good bend of stifle, without exaggeration. Metatarsus (Rear Pastern): Parallel, giving plenty of drive. high-stepping. Hindquarters providing plenty of drive. Well co-ordinated; straight action front and behind. Hair: Whether rough, broken or smooth naturally harsh, flat, straight, close and dense with good undercoat. Weather-resistant. Belly and undersides coated. The prepared (i.e. trimmed) coat should appear natural, never clipped. Colour: White or predominantly white with tan, lemon or black markings, or any combination of these colours. The colour preferably confined to the head and/or root of tail, but a little body colour is acceptable. Males: Ideal height 36 cms. Females: Ideal height 33 cms. Most importantly soundness and balance should be maintained whilst taking into account that this terrier, bred to work fox, should be capable of being spanned behind the shoulders by average sized hands. With these provisos, lower heights are acceptable, however.